Derby Day! software manages a Cub Scout pack level Pinewood Derby race. It provides an informative and attractive spectator experience, while being simple and extremely easy for the race manager to use. Derby Day! uses the ladderless elimination race method. Points are accumulated after each race. First place gets 0 points, second place 1 point, third place 2 points, etc. A car is eliminated when the defined point level is accumulated. The race winner is the last car that has not been eliminated. This race method produces a very exciting race day experience for the scouts. Unlike time-based races, winning a heat race means something, and the scouts easily follow the points system. Winning a race means 0 points for me! Suspense builds as the racing continues and cars are eliminated, until the final race that leaves only one car standing. This application requires the .Net Framework 4.0 to run. Get the .Net Framework here. Having trouble using the install button? Download the Derby Day! installer here. My oldest son joined Cub Scouts three years ago, and the Pinewood Derby is one of our favorite scout events. For the first two years, I watched the race manager fight an Excel spreadsheet created by a past parent, to track race results and set up the races for each heat. While this spreadsheet worked, it required a lot of effort from the race manager, resulting in many long delays between heats on race day. Knowing that software could improve this, I went looking for a program. There are a few commercially available products, but a quick evaluation of each was disappointing. I wanted to find something that was easy to use. In our pack, a new parent runs the race every year, so ease of use is very important. I also wanted to find something that would improve the race day experience for the audience. I wanted to pair cars based on their performance, maximizing the number of scouts that will win a heat race. And finally, I wanted to avoid having to use elapsed time-based results. My son has advanced to our district race twice, where elapsed time racing is used. In my opinion, these races are just not as exciting. After the first round, you know which car is likely to win, removing most of the suspense of competition. In the end, while the commercially available products have lots of features, those features make them complicated. They also seemed to favor timed racing, which does make sense for the larger district and council races. For our pack though, I thought that I could do better and so decided to create Derby Day! Derby Day! made its debut at our last pack derby and it was very successful. I gave the race manager the software the week of the race, along with a few short instructions and then let him go. On race day, I watched a very smooth and exciting race unfold from the crowd as I cheered on my boy’s cars. 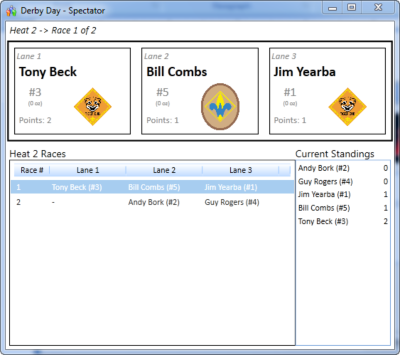 The software worked so well for our pack derby, I'd like to make it available, free of charge, for any pack. And so I present to you Derby Day! If your pack uses the ladderless elimination method, or doesn’t but you’d like to give it a try, then Derby Day! is for you. You’ll be able to run a race in just a few minutes. If you like Derby Day! please feel free to leave a small donation. Even a $1 donation is appreciated.